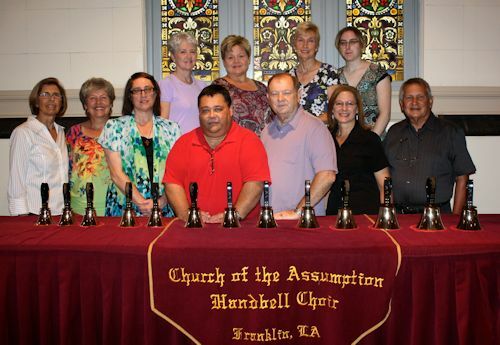 The Church of the Assumption Handbell Choir was founded in 1984. The choir belongs to the American Guild of English Handbell Ringers, Inc., which is a nonprofit organization to promote the art of English Handbell ringing. The ringers are dedicated to advancing the musical art of ringing during the liturgies and on special occasions in the Church and the community. The choir presently has ten members. Practices are held every Tuesday at 6:30 p.m. in the Church. Anyone interested in joining the handbell choir can contact Dale Fangue, director, at 985-399-0055.